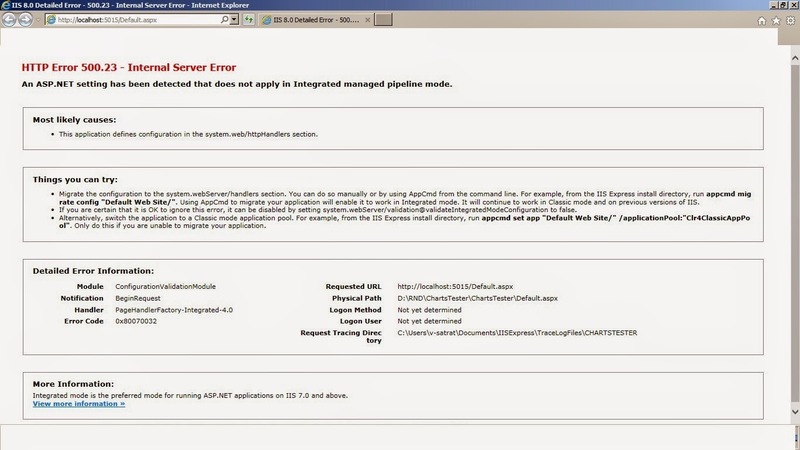 ASP.NET setting has been detected that does not apply in Integrated managed pipeline mode. That generally you will get when you are changing the VS2010 project to VS2012 –Vs2013 projects. This flag will not alter the behavior of the application , it will only tell IIS to not flag an error; it will override the three new changes feature for IIS7. Your application's Web.config file specifies <identity impersonate="true" />. Application defines the <httpModules> section in Web.config file. IIS 7 Integrated mode, ASP.NET modules are specified with native modules in <modules> section under <system.webServer>. Application defines the <httpHandlers> section in Web.config file. IIS 7 Integrated mode, ASP.NET handler mappings are specified in unified <handlers> section under <system.webServer>.